“Finding this girl is not who I am anymore. That action is soft; I am practical. That action is hopeful; I am not. The world is crazy; I can’t change that. In all honesty, that just about sums it up. But, I also know you’re not here to see various particles of the internet explain what I mean by amazing – so, lemme shed some light on this situation. The Girl In The Blue Coat is a story about what it means to be brave. It is a story of friendship, of love, the power of choices, and fighting back against innumerable odds in the smallest ways you can even when all else fails. It is a story about war and how we survive it by whatever means necessary. It is a story of decisions, of courage, and of ingenuity. Is is the story of what happens when the monster in your closet comes out to play — and it is beautiful, terrifying, and gut wrenching. It builds and builds and just keeps on building until all you can do is hold on and power through. It is unforgettable. 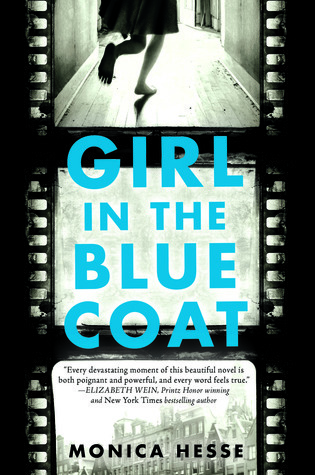 In The Girl In The Blue Coat, Monica Hesse has taken horrific events in our world’s history and has created something powerful that deserves to be read. This book is stunning and it is something I will never forget. First things first, the language in The Smell Of Other People’s Houses is absolutely stunning and it beautifully illustrates the complexity of the issue at hand. When I was reading this book, I felt like I was actually there while simultaneously watching a carefully crafted masterpiece unfold before my eyes. Each word matters, each sentence is a piece of art that cannot be overlooked – just like the book itself. The Smell Of Other People’s Houses is the story of four Alaskan teens in the nineteen-seventies whom are thrown together through their various secrets and who must learn to live with what they have been given. Each of their individual stories was astounding, not to mention the gorgeous complexity of their lives when they are suddenly thrust together. Ruth, Dora, Alyce, and Hank – each has a secret or something they are running from, and each must learn to rely on someone else to bear the weight of their struggles. 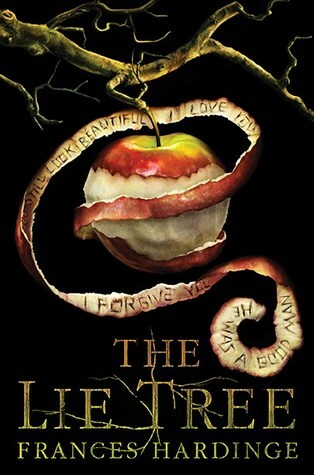 The development of the characters, hell, the development of the plot throughout the book as a whole was breathtaking. It was simply stunning. Watching these teens -these real people -work through issues that they shouldn’t have to and yet everyone can connect to in some way, brings forth one of the most profound stories in Young Adult fiction I think I’ve ever seen. I knew nothing of The Smell Of Other People’s Houses when I got it – no synopsis, no prior mention, nada. I went down the rabbit hole that is four teens in Alaska without knowing what I was getting myself into – and boy am I glad I did. In all honesty, I think not knowing made the experience all the more powerful. I had no prior expectations, no idea what it was about – all I knew was that the cover was gorgeous and the title made me giggle. I have to say, this book is one of those rare, inevitably captivating stories that will grab you by the ankles and drag you kicking and screaming into these teen’s lives. It will make you stop and think about what your home means to you, it will make you question everything you think you know – and it will make you realize that everyone, and everything, has a story, too. One thing I really liked, besides the obvious, was the amount of information I learned. I don’t know how much is true and just what is fictionalized for the plot of the book, but the complete other-worldliness of Alaska and the different ways these people live just blew my mind. From the very first page, and I’m talking the Prologue here, I found myself undoubtedly and impossibly enraptured with the differences. For example, right off the bat Ruth is explaining how her favorite cut of meat is Backstrap – something I’ve never heard of – and she describes how her father carving the deer is just as graceful as her mother curling ribbons on presents. Just think about that for a second. Not only is there a beautiful juxtaposition of language, but the whole process of carving a deer carcass within the home has become so normal to her that she compares it with gift wrapping. It blew my mind, to be honest. That isn’t the only example, but there are far too many for me to ever accurately explain. Just… read it and see for yourself. The Smell Of Other People’s Houses is, hands down, one of the most interesting books I’ve had the pleasure of reading so far this year. Not only is the plot unique and interesting, it is specifically centered around a subculture we never pause to think about – hell, it was something I never even knew really existed. 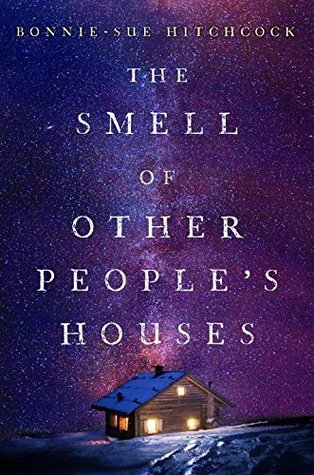 The Smell Of Other People’s Houses is a heartbreaking tale that isn’t afraid to deal with hard hitting issues such as teen pregnancy, death, abandonment, abuse, racism, and poverty. It was breathtaking, plain and simple. While I have never read any of Ruta Sepetys’ work before, her name has always been floating around in my mind. I remember hearing about Between Shades of Grey. I remember seeing it on the shelves way before I started blogging. I remember resolving to read it later and put it back. Well, now I can say I made one of the biggest mistakes when I put it down. 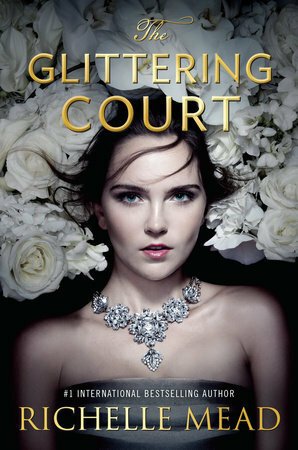 Ruta Sepetys is brilliant – her work nothing short of pure genius. Salt to Sea is only the tip of the ice berg about to crush the flood gate and let the rising tide through. Salt to Sea takes place in 1945 – four years after the German invasion of Russia during WWII. While the war may be drawing to a close, the terrors are still fresh and a daily occurrence in the eyes of refugees fleeing for a ship off the coast. 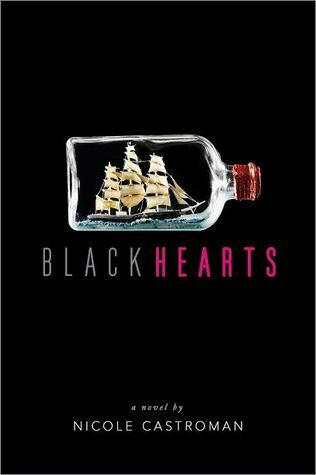 Then the ship is attacked by a Russian submarine, and the refugees are forced to watch their only chance of hope sink right before their eyes – and then they must find a way to survive. This book is told through four perspectives: a runaway, a thief, a burdened teen, and a Nazi. Joanna is a runaway from Lithuania and a nurse. Her heritage is what drives her throughout the story, the guilt she feels over abandoning her family to create a future for herself is what fuels her need for survival. She was smart, brave, and oh so strong. Then we have a thief, Florian, who was so complex it was like trying to solve a Rubik’s Cube blindfolded (hint: I can’t even solve them with my eyes open). His only goal – despite his random and daring acts of kindness – is to find a way to be free of Germany and all of the pain it represents. Then, my favorite for more reasons than I can possibly describe, Emilia. She broke my heart. She’s just so…. real. No matter what happens and what she had already lived through – she just puts one foot in front of the other and keeps truckin’ on. She refused to give up even when giving up was the easiest thing to do. She was so steadfast, so fierce and shameless in her bravery. It was beautiful. Now, the most surprising of the bunch – Alfred. I have no idea what to say about him…. he is everything I hate about WWII and Germany at the time, and yet… it was so damn interesting to see things through his eyes. If you’re looking for a happy book, a book that will make you smile and help you sleep at night – turn back now. Salt to Sea was not easy to read in any way, shape, or form. It was painful. Each word was like a sharpened knife with a laser sight set directly on your heart. The war was not kind, we know that from our history – but seeing it like this, having it up all in your face flashing every single thing you never wanted to see and what you wanted to forget even existed… Just wow. I had to put this down more than once and walk away. I had to take breaks. Hell, at one point I even chose to do my homework rather than keep reading because it hurt so much. This doesn’t make light of what happened – nor does it make it so obviously horrible that it becomes trivial. It is a careful balancing act. Humans are a bunch of monsters. That’s something we should never forget. Salt to Sea is one of those special books. It’s one of those books that forces you to stop and think, to remember. 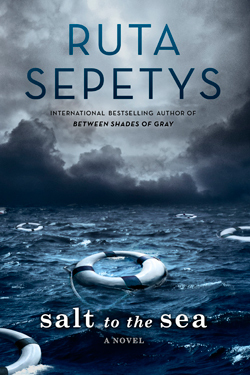 Ruta Sepetys creation is a masterful weaving of history, pain, and what it is like to hope when it seems impossible. If you have any sense at all, you will find this book at the nearest opportunity so that you may share in the pain of millions – even if only for four-hundred pages. So this is a little out of my normal sphere of reviews – but I decided to do it anyway. Let me tell you, I am so glad I said yes and took the time to read Violinist of Venice. Going into this, I had no idea who Vivaldi was, what he did, nada. I didn’t really know much about the time period other than what I could assume from the label of ‘eighteenth century’ – but The Violinist of Venice did one thing exceptionally well (actually, it did a lot of things well) and that was educate me on the time period and the circumstances of those involved. 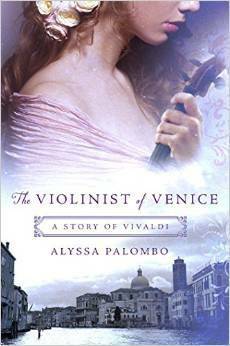 The Violinist of Venice is a breathtaking, lyrical, and stunning novel about a young woman named Adriana D’Amato and her love affair with the great composer Antonio Vivaldi – and yet, it is also so much more than a love story. This book details one woman’s journey from abuse and fear into being a confident woman capable of doing what is necessary for her own happiness. I did find this book a little difficult to get into at first, but over time, I found myself growing increasingly immersed in the story. The lyrical prose wove a strong connection, just as the description of music and love pulled me deeply within the sweeping narrative. While the beginning of the novel felt a little too rushed for my taste, the rest of the book was perfectly paced and it left me wanting more – it left me on the edge of my seat craving more from these characters and this setting even though I knew that the story was over. If that’s not skill, then I don’t know what is. Speaking of the characters… oh my goodness, the scope of the character arc tackled throughout the course of this book seemed horribly daunting, and yet Palombo tackled it with poise and grace. Adriana’s transformation from beginning to end was awe-inspiring and the perfect example of how a character should be changed by the events in their life. She was naïve, innocent, and almost the stereotypical, somewhat annoying youngling that didn’t know their left foot from their right. Yet, at the end of the book, Adriana is a confident, strong woman who chooses forgiveness despite all of the wrongs committed. She finds the will to ignore society’s expectations and live the life she wants to life – it was inspiring, especially for a woman of that time. I think my favorite part, though, aside from the character development, were the descriptions of playing music. Boy did that bring me back. I used to play the cello… and reading the way Palombo tackled the concerts and performances both brought back memories and made my fingers ache for the strings once again. I could hear the notes play through my head and I could imagine it was my own hands creating such beautiful sounds – it was incredible. The Violinist of Venice is well worth sticking through the convoluted beginning. Not only is it a story of passion, strength, and determination, it is also a story of individuality and the power of your own voice against a larger society. This book is inspiring, it is humbling, and it – by far – is one of the best uses of history and music I have ever seen in literature. Overall, this spellbinding read is the prime example of why literature is beautiful and why I love to read it. 1. What made you decide to set your novel in 18th century Venice? How did that affect your writing process? Since the original idea was about a relationship between Antonio Vivaldi and one of his students, it always had to be set in 18th century Venice, as that’s when and where he lived and worked. With that said, when the initial idea came to me, I knew hardly anything about Vivaldi or Venice, and ended up doing the research as I went, because I couldn’t not start writing right away. In the end the book took me a lot longer from draft one to a finished, polished draft because I needed to take time for research in the midst of things. A lot of elements and details in the early drafts needed to change based on things that I discovered while doing the research, but the overall arc of the story remained the same. 2. What advice would you give aspiring authors? I think it goes without saying that you need to read A LOT. Read books in the genre you want to write in, but read books outside of that genre as well – doing so will ultimately make you more well-rounded as a writer. Also, know that you’ll need to make a lot of time to write if you’re serious about being an author, but make that time however and whenever works best for you. Don’t feel like you need to write every day if that doesn’t work for you – I found that that doesn’t work for me, as if I’m working on something for a stretch of days in a row, after a while I start to get burned out and need a day or two away so I can come back to it fresh. So go about finding/making your writing time in whatever way makes you the most productive, and make that your routine. 3. How much research did you do prior to writing the book? As I mentioned above, basically none! I was so excited about the initial idea that I started writing right away, because I couldn’t stop thinking about the story and just had to get it out. I did the research along the way. And once I had a full first draft, I knew specifically where the holes were that I had to fill with historical information, so that helped me to focus my research a bit. I don’t know that I recommend this method for researching and writing a historical novel, but it worked out for me in this instance! 4. Why did you include all of the technicalities about music? What do you think of the general response that it has gotten? I’m a musician myself, so those musical technicalities are a language that I myself speak, and in writing about music and musicians it never occurred to me to not include those technical details, as that is how these characters would have spoken and thought about the music. That was the one aspect of the novel that I didn’t really have to research! I realize that the technical musical jargon might be boring or off-putting for some readers who aren’t familiar with the terminology or aren’t as interested in that aspect of the story; I know that’s happened so far and will continue to happen, I’m sure. With that said, though, some people that have read it and are not musicians have really enjoyed the musical details anyway, so I think it’s like anything: it will resonate with some readers and not with others, and that’s fine. That’s the nature of fiction. I wrote a book that I myself would want to read, and as authors I think that’s all we can do. 5. Do you plan to venture out of the Historical Fiction realm for your next novel? My next novel (for which I’m currently working on revisions with my editor at St. Martin’s) is also historical fiction, set in Renaissance Florence. I’ve also started drafting a new novel that I hope will be my third, which is again historical and is set in post-Revolutionary New York State. So I’ll definitely be sticking with historical fiction for a while and don’t think I would ever abandon it, but with that said I would also like to write novels with a contemporary setting at some point as well. I have a few ideas in that vein, and I have a contemporary adult fiction manuscript that I’ve been playing around with when not working on other things – I call it my “love affair project”  It does have quite a bit in common with Violinist in that it’s also about music and musicians, but this time the musicians are in a heavy metal band! Maybe someday the world will see that manuscript – at the moment I’m content to just see how everything goes!